Darnell Eaton isn't afraid to admit that the only A he ever received on his college report card was in his improv class. This is what provoked Darnell to seek out his improv training at WIT in 2009—it has been a roller coaster ride since then. Darnell is a one of a kind trained actor who brings very dramatic characters in his Improv and is a pitbull when it comes to own his on deal. He’s been in the DC Improv scene since 2009 and has been on three WIT ensembles, including iMusical (current), Love Onion, and the WIT project: Citizen’s Watch. He was also a part of Laugh Index Theatre and a former player on Hot & Sweaty, Cloaking Device, and Community Sauna. Darnell is also active in the DC indie improv community and performs regularly on Lena Dunham, Ugh, and Aboulia! He was formerly on California King, Freefall, and the group that started his Improv journey in 2009, Subsidized Corn! Darnell is also on the faculty at WIT and has instructed classes and workshops in Ward 8, teaching and training both adults and children in efforts to bring awareness of the Improv art to the under served and underprivileged community. 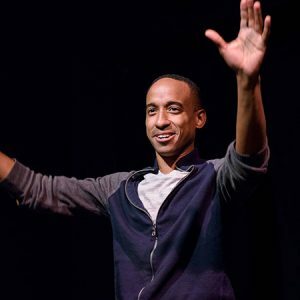 Darnell has performed with a number of improv shows in New York City, Chicago, and all throughout the Washington, DC area. Currently, he can be seen performing with Subsidized Corn, FreeFall, Laugh Index Theater, Allergic to Winter, and a duoprov troupe called Tell Your Friends. He also produced SubCo De Mayo in Washington, DC and Corn Abroad at the Adelaide Fringe Festival in Australia, and stars in his nerdy web series The Web Developers. Darnell has a niche for bringing physical, emotionally ranged, and high energy characters in his scene work and has been trained in number of acting, clowning and movement technique classes offered at Synetic Theater and Studio Theater Conservatory. His passion lies in theater of which improv has been a significant tool he’s used to enhance the charm and life he brings to the characters he plays on stage.